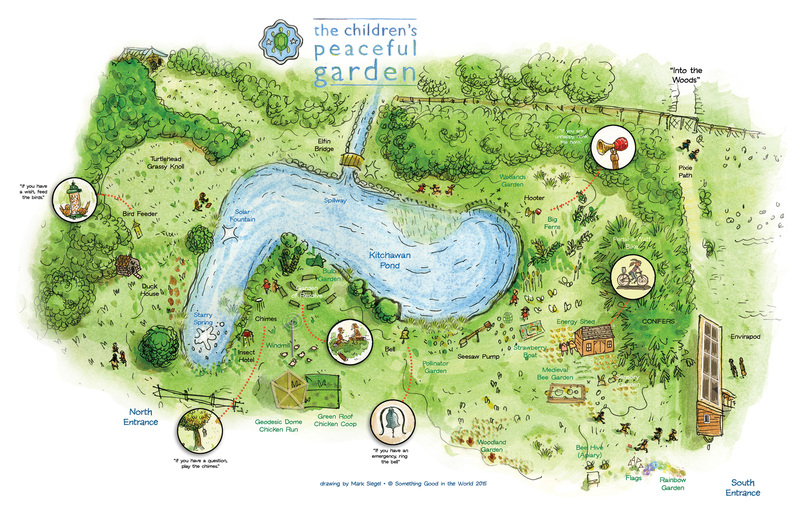 With support from an international team of gardeners and landscape artists, the Children’s Peaceful Garden was created for the first time in 2000, and became a template for children’s play spaces around the world. The project includes adults and children working together to create a sanctuary dedicated to peaceful and imaginative play, while learning how to plant, landscape, and design in harmony with the environment. The Children’s Peaceful Garden includes native woodland plants, flowers to attract beneficial insects and pollinators, sensory-oriented gardens, organic vegetables, a constructed wetlands and pond fed by run-off water, as well as “trash to treasure” constructions from recycled materials. SGITW’s Children’s Peaceful Garden is currently located at Kitchawan Farm in Ossining, NY. (Visitors are welcome by appointment, or by registering for one of our workshops, programs, projects, or volunteer days.) And recently, we collaborated with the educators at Ku’a Learning Academy in Hawaii to create a CPG there. Read more about this exciting program here. In September 2016, Something Good in the World was selected by The Jane Goodall Institute to represent their Roots & Shoots program at the United Nations International Day of Peace event in NYC! Each year the International Day of Peace is observed around the world and is devoted to strengthening the ideals of peace, both within and among all nations and peoples. The following month, our Children’s Peaceful Garden was chosen as Roots & Shoots Program of the Month. Read more about it in Jane Goodall’s ‘Good News for All‘ post here. Needless to say, we couldn’t be more honored by this ongoing partnership and are continually inspired by the work of this amazing organization! Interested in starting your own Children’s Peaceful Garden? Check out our start-up guide here.